From recurring revenue to a debt-free balance sheet, this fast-growing gem truly has it all. I'm a firm believer that winners tend to keep on winning. That's why I'm far more likely to buy a growth stock near its 52-week high instead of its 52-week low. My investing strategy may be diametrically opposed to common investing wisdom, but following this maxim has allowed my portfolio to handily thump the market over the last few years. One winning stock that has recently captured my attention is HealthEquity (NASDAQ:HQY). It boasts a sky-high valuation and trades near its 52-week high, but I still think that right now is a great time to be a buyer of this fast-growing stock. HealthEquity operates a cloud-based platform that individuals can use to better manage their healthcare costs. While the platform can be used for a range of healthcare-related services (like comparing treatment options, earning wellness incentives, paying medical bills), it's primarily used as a tool to open and manage a health savings account (HSA). HSAs are triple tax-advantaged accounts that employees with high-deductible healthcare plans can use to eliminate taxes from their healthcare spending. Eligible employees can contribute up to $3,450 per year as an individual, or $6,850 as a family, from their paycheck to an HSA using pre-tax dollars. Anyone age 55 or older can make an additional catch-up contribution of $1,000. The money can be invested and grows tax-free. As long as the funds are used to pay for qualified medical expenses, there are no taxes to pay on disbursements. Unlike a flexible spending account, an HSA allows funds to be rolled over from one year to the next. The account is also portable, so a worker can keep it when changing jobs. These perks make HSAs an easy choice for eligible employees. However, to qualify for an HSA, people must be enrolled in a high-deductible healthcare plan -- in other words, the annual deductible must be at least $1,300 for an individual, or $2,600 for a family. This deductible requirement explains why HSAs were slow to take off when they were first introduced, in 2003. However, healthcare premiums have soared in recent years. Since the average high-deductible health plan offers premium savings of $1,900 annually for employers, these plans are more common now. This has fueled a huge rise in new HSA accounts. Currently, about 22 million HSAs are active in the U.S., and they collectively hold about $45 billion in assets. These numbers are expected to rise to 29 million and $64 billion, respectively, by the end of 2019. Health plan partners and employers pay monthly service fees to offer the platform to subscribers and employees (40% of revenue in fiscal 2018). The company earns custodial revenue for assets held under management (38% of revenue in fiscal 2018). The company earns interchange fees whenever disbursements are made through its payment networks (22% of revenue in fiscal 2018). The company also earns a small amount of revenue from recordkeeping and investment advisory services. What's wonderful about HealthEquity's business model is that nearly all of its revenue is recurring in nature. That's allowed the company's revenue and profits to surge as its user base and assets under management have swelled. HQY Revenue (TTM) data by YCharts. HealthEquity also sports a debt-free balance sheet that was packed with $240 million in cash at year-end. Overall, this business is in excellent financial shape, and its profits should be able to increase at a faster rate than revenue in the years ahead as operating leverage continues to work its magic. In a nod to an idea from a famous book by Seth Godin, HealthEquity refers to its own culture as "DEEP Purple." This is shorthand for "driving excellence, ethics, and process " while providing customers with remarkable service. While "DEEP Purple" may sound like corporate nonsense, the company has the numbers that prove that the concept is resonating with customers and employees alike. Customer retention rates have been north of 95% for many years, and HealthEquity earns a strong 4.3 stars out of 5 on Glassdoor.com. CEO Jon Kessler also boasts a 96% approval rating and 90% of employees would recommend the company to a friend. I also like that HealthEquity's founder, Dr. Stephen Neeleman, still plays an active role in the company. Neeleman serves as the company's vice chairman in addition to being a practicing general and trauma surgeon. CEO Kessler and Dr. Neeleman also own 1% and 2%, respectively, of the company's shares outstanding, while directors and executive officers collectively own 19%. I like seeing high levels of "skin in the game" in companies that I invest in. It's not often that I come across a company that boasts a great business model, has a strong culture, offers mouthwatering financial statements, and has a huge opportunity for growth ahead. 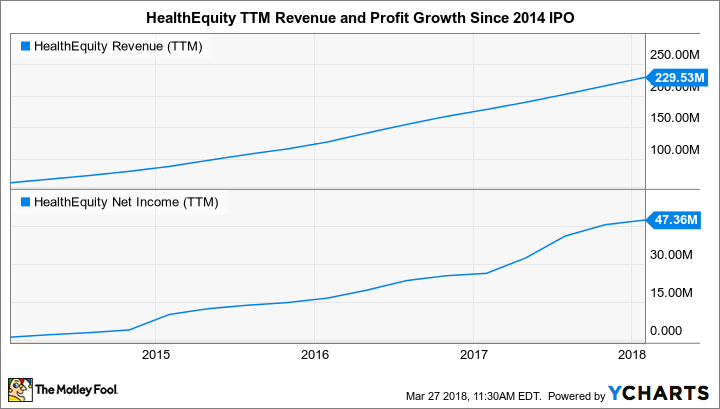 The only knock that I have against HealthEquity is that it's trading for 16 times sales and 50 times next year's earnings estimates. Both of those numbers are super high -- so if the company fails to keep delivering strong growth, its stock could certainly take a tumble. Despite the risks, I believe that HealthEquity is such a high-quality business that it still makes sense to purchase today. In fact, I recently became a shareholder myself, and will happily add to my position as soon as the Fool's trading rules allow.